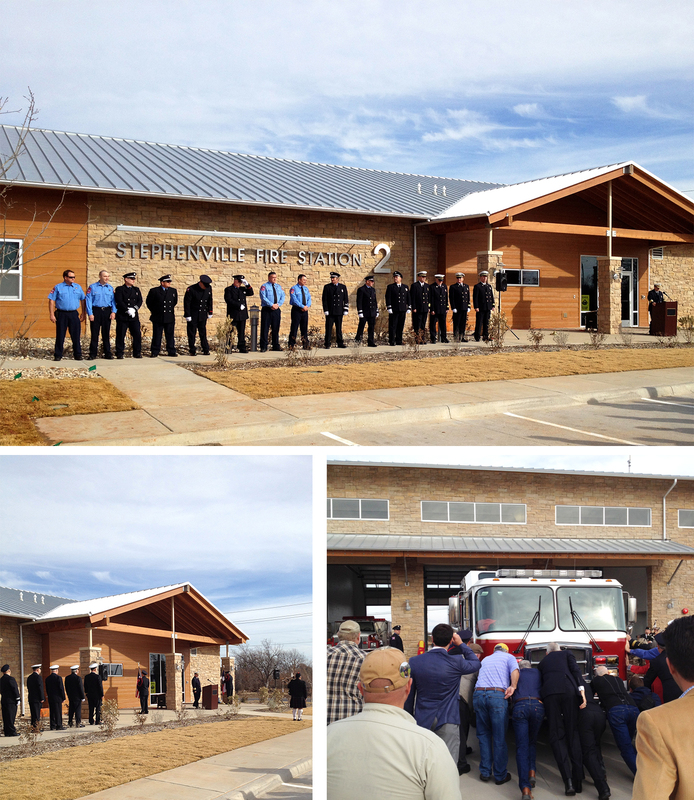 Last Thursday, December 19th, Fire Chief Jimmy Chew dedicated the new Fire Station No. 2 to the Stephenville Community. The main ceremony was held outside the station before Chief Chew invited the community inside to tour the new facility. As the newest Fire Station to be built in almost 50 years (The previous Station No. 2 was completed 1954), this station is assuming most of the fire protection responsibilities including administration, training, housing of needed equipment, and quarters for the firefighters. Chief Chew noted the many traditions that fire departments have when a new station is opened. He briefly explained a few of the traditions being observed in Stephenville. The flag ceremony was performed by the local combined Color Guard (bagpipe and axes). One of the other traditions is having the newest firefighter steer the pumper truck into the apparatus bay with the community pushing the truck (as shown). Mayor Kenny Weldon and Chief Chew thanked all the citizens and city officials, past and present, that participated in making Sephenville Fire Station No. 2 a reality, noting that this was a community effort started over ten years ago.